Dottie is waiting for the Christmas feeling to arrive - that fizzy, excited feeling, where everything is a bit magical. But this year, Dottie, her brother, Jem, and their dog, Shortbread, are staying with Grandma and Grandpa. Grandma and Grandpa are trying hard, but Christmas just isn't the same...A gorgeous, heart-warming story about misplacing the Christmas spirit, and finding it again. Lili Wilkinson is the award-winning author of ten YA novels, including Scatterheart, Pink and Green Valentine. After studying Creative Arts at the University of Melbourne, Lili established the insideadog.com.au, the Inky Awards and the Inkys Creative Reading Prize at the Centre for Youth Literature, State Library of Victoria. She has a PhD in Creative Writing, and lives in Melbourne with her husband, son, dog and three chickens. Amanda Francey grew up on the leafy edges of Brisbane, Queensland. She studied at Queensland College of Art and worked for many years in graphic design and art direction before returning to her childhood dream of illustrating children's books. 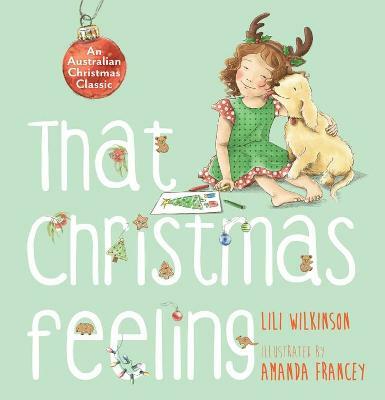 Amanda's first picture book, Jonathan!, written by Peter Carnavas, was shortlisted Speech Pathology Australia Book of the Year Award (3 to 5 years) 2014. Her most recent picture book, Take Ted Instead, written by Cassandra Webb, was listed Children's Book Council of Australia, Notable Book (Early Childhood) 2017.